Follows up on the basics presented in Lesson 1. 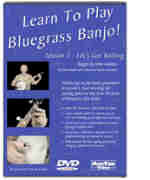 Start learning the picking patterns that form the basis of bluegrass style banjo. Lesson 2 explains and demonstrates the basic right hand patterns, called rolls, and adds them to the simple melodies taught in Lesson 1. Download now from PlayBetterBluegrass.com!